Not all sizes are stocked in every finish. Please allow 2-3 weeks before shipment. 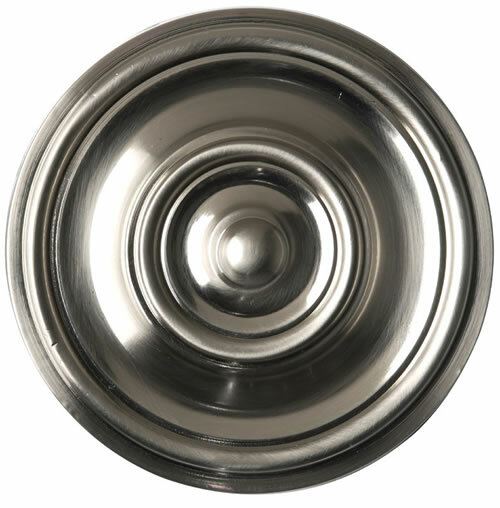 Satin Nickel Kick Plates are available in 6" x 8" heights and several widths. You can also choose from screw mount, magnetic mount and adhesive mount. Please double check the width you order to make sure you get the right kick plate. Generally you will want to order a kickplate that is 2" shorter than your door width so that it doesn't get in the way of your door trim and weatherstripping. So if you have a 36" door for example, you'll want to order a 34" wide kickplate. Many kickplates are custom made to order in the finish you need. Some standard sizes are in stock, but please allow 2-3 weeks before shipment. Satin Nickel screw mounted kick plates are easy to install. Check out our kickplate installation page for more information. The kickplate was packaged with sturdy cardboard and a piece of masonite inside to keep it from bending. It arrived in perfect condition and is a high quality product. I would highly recommend ordering from this company. This was the right kickplate I needed. It matches the door knob and it resists the outdoor elements, unlike the chrome brass type. It's a pleasure doing business with Direct Door Hardware. 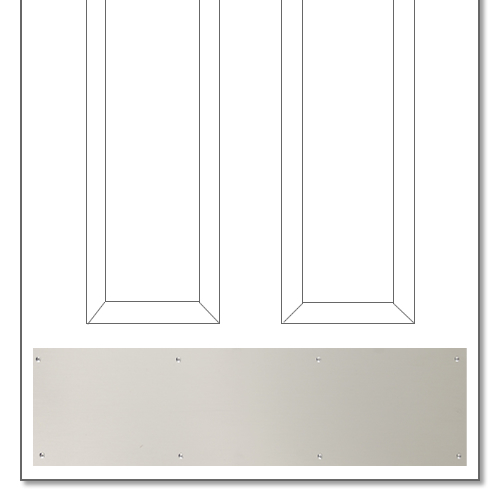 The satin nickel kickplate looks and fits fantastic on our mahogany doors. Love the nickel kickplate - had a brass one for years - just recently changed out hardware to nickel and this completes the look. Thank you! This is the perfect remedy for a metal door that you do NOT want to drill holes in to have a kick plate. The finish is beautiful, installation a no brainer, magnetic backing just place on the door. Plus super fast service, a company you would do business with again. Hope you have a metal door - the magnetic kick plate is the ONLY way to go. You can reposition it so it has just the effect you want. Quality - superb. Matches my door hardware and definitely kicks up the appearance. This was really easy to DIY. Works great. Holds fast to a metal door. It was wonderfully protected for shipment and came out of the box with no blemishes to speak of. I ordered a more expensive kickplate through Lowes and I had to send it back because it was the wrong size and came damaged in shipping. Lucky for me. I ordered one through Direct Door hardware and it was better quality at half the price. Love the kickplate. We couldn't get a magnetic one locally, so were happy to find it on line. Even our contractor couldn't locate a store (Lowes, Menards, Ace, etc.) locally to order. Packaged well, shipped fine, and is exactly as described. If we need anything else, we'll be back! Thanks!!! Perfect. Shipped very carefully. Shipping was a bit slower than expected, but worth the wait. How much can I say about this product? It arrived on time, had no scratches, was covered in a protective sheet of plastic that made installation a lot easier (since I didn't worry as much about screwdrivers slipping), and looks great. Had to drill 10 small pilot holes for the screws, and it went on (on my wooden door) in about 5 minutes. Fit the door perfectly, and looks great. 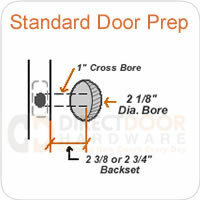 We are very pleased with the quality & appearance of the kickplate and highly recommend DirectDoorHardware.com. My wife was thrilled to get the style of kickplate she wanted in the exact size to fit our door! This is my third order for kickplates...the quality, the ease of instalation is fantastic! Everything from the original order, through the actual ordering and ultimately customer has been a pleasant and exceptional experience. I will definitely order through DirectDoorHardware again! Product is exceptional. Very attractive and appears to be resisting the outdoor elements very well. Magnetic options is ideal for painted steel doors. Direct Door Hardware is fast and efficient, an overal outstanding e-merchant. If I order the kick plate with the adhesive or magnetic mount, does it still have the screw holes? How much of the back of the kickplate has magnet on it? Is it only in the corners, middle, or all over the back? How long is this item guaranteed to last on the door? Will cold or warm weather affect it's magnetization? Thanks.